Theo was seven when he was taken from Rwanda and given a new foster family. Plagued by terrible memories of tribal genocide, Theo is given a new chance in Dublin, but as he grows up and falls into selling drugs, he begins to wonder if you can ever escape your past. The other voice we hear in the novel is Deirdre’s. She is a forty-year-old ex-nurse working in a restaurant, washing dishes. Her husband beats her. Her children test her with their adolescent disaffection. When Theo starts at the restaurant, working alongside her, they form a surprising friendship, one which helps them face their increasingly entangled and dangerous lives. In a way there is little else I want to say because revealing the plot would feel partly facile – in that the novel is about exploring the complexities of our individual histories – and partly make people less inclined to read the book. The novel does not send us down twisted plotlines (though I don’t mean to suggest that the plot is predictable – it isn’t), but works towards a personal reckoning that we feel coming from the beginning. And ultimately Rain Falls on Everyone is more about similarity than difference, more about hope than tragedy; danger, violence, greed, love and beauty are everywhere. I enjoyed the novel’s craft and admired its subjects and themes. 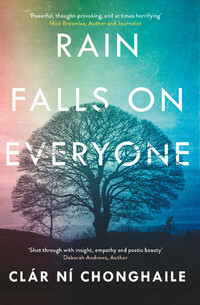 Rain Falls on Everyone won’t appeal to all readers, but you’ll know if this kind of story is one you’d enjoy. It certainly made me want to look out Fractured, Clár Ní Chonghaile’s debut novel. Next week I’m reading The City Always Wins by Omar Robert Hamilton, but I’m away for a couple of weeks so the review may not be up for a while. I’ll post more than one review on my return.